As we approach the year 2020, it is crucial to remind ourselves of APTA’s mission statement and how achieving the vision of transforming lives goes hand in hand with cultural competency. As a physical therapist, you may say that you have a clear understanding of what it means to have cultural awareness. After all, by this point you have probably worked with a diverse range of patients through your clinical rotations. However, one important thing we need to always call to mind is that there will always be room for cultural growth and development. Even I, as a minority who has lived and breathed a hispanic culture, know that cultural awareness is a vital component to improve and enhance both physical therapy as a profession and the lives of others. Regardless of whether you feel that you’ve learned or had enough exposure to other cultures or not, the threshold for cultural competency is limitless. To really get the gist of how beneficial cultural awareness can be in your clinical setting, we must understand what this actually is! According to Rhonda Livingstone, ACECQA’s national leader, cultural competency is defined as “the ability to understand, communicate with and effectively interact with people across cultures.” This begins with understanding your own worldview and cultural values that shape you into the person you are today. What are those values that you grew up with and how might they differ compared to those around you? Ask these questions when treating patients of different backgrounds, because having competency is more than just appreciation or tolerance of cultural differences. More or less, it requires us to identify and challenge our own beliefs in order to help us understand how our behavior can significantly impact the experience of others outside of our cultural norms. So how will this help us become better physical therapists? As a health professional, I’m sure you are well aware of the fact that if someone does not trust you, they will not seek help from you. I can think of countless times where my parents actively sought a different physician because they never developed a level of comfort with them. Show your patient that you understand the pain they are going through. Connect with them by consulting your concerns regarding their wellbeing and share a little piece of who you are and where you are coming from. Express that we are here to help them by explaining what you are doing and why it’s important. We need to humble ourselves, as it is easy to forget what it’s like to be in an unfamiliar environment. Most cultures have their own understanding of therapy, as well as own healing expectations, causing confusion or discomfort with treatment. Patients of different cultures may have religious restrictions that do not allow them to show skin or be touched in certain areas, which could potentially limit your ability to perform manual therapy. Though it may get frustrating and somewhat challenging to work with culturally dissimilar patients, it’s necessary to maintain a positive attitude and remain sensitive to their values in order to develop a secure and reciprocal relationship. As cliche as the saying “treat others like you would like to be treated” may be, it holds its meaning, especially to those patients that may show up to your clinic already feeling alienated. We need to let them know that we’re aware of any restrictions or requests they may have, to listen closely and give them the option to speak up. Not only would respecting the patient’s cultural differences allow them to respond in a respectful manner towards you, it reassures them that you care about their personal well-being and reminds them that they are valuable. Someone who feels respected is going to be more inclined to follow their treatment plan, don’t you think? Cultural competency leads to better COMMUNICATION! I work in an outpatient clinic where a majority of patients currently being treated are of hispanic descent and are predominantly Spanish speakers. If you’re fortunate to be bilingual or have an aide, like myself, help translate for you and the patient, this might seem like a major advantage to have. However, of all daily communication, around 90% of it is actually nonverbal communication. This means that you can still get your job done efficiently even if there is a language barrier! If you pay close attention, you will realize that everyone’s behavior and attitude have already been determined by a mesh of systems, including family, education, psychology and more. Understanding these systems works in our favor as therapists, because it allows us to pick up subtle cues to why someone may or may not be willing to participate in therapy. For instance, due to social norms within each culture, your patient may be more inclined to hide pain as pain may be viewed as a sign of weakness. Coming from personal experience, in many hispanic cultures, men are reluctant to admit that something is too difficult, even if they’re in excruciating pain, because any sign of weakness means that they aren’t “macho” or manly enough to do the job. Being aware of cultural customs can help us strategize and set up the perfect “game plan” for the patient in order to properly ensure they have the best quality of care. By taking a good look at the demographics of the community we serve, we can cultivate a better understanding of the culture and respond methodically to any current or projected behavioral changes. Not only would it make our jobs easier, but would enhance our means to communicate efficiently and help overall maximize our role as clinicians. 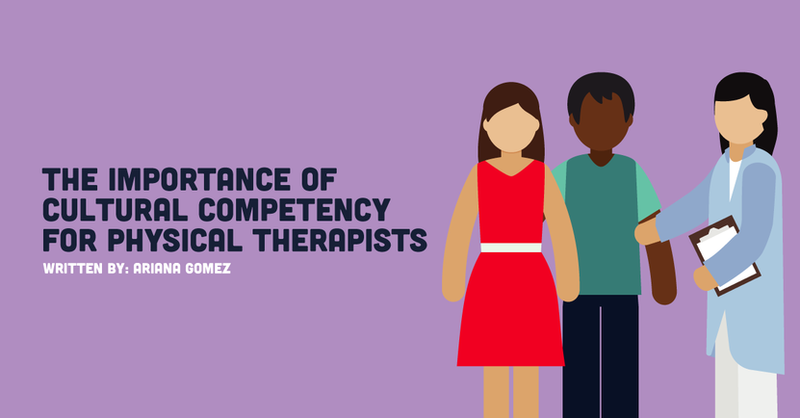 Though cultural competency may not improve overnight, being aware of all the benefits it comes with allows us to continue to evolve the profession and the lives of others that need us to be the best physical therapists possible. Most importantly, understand yourself because all changes of scope come from within. Hopefully by keeping that in mind, we can improve all aspects of physical therapy and patient care from now on and beyond.